So we got a Vitamix machine. I try to avoid using the term “blender” because it’s really more than that. Without exaggeration, it’s a life-changing appliance. Anything you made in a traditional blender comes out infinitely smoother in a Vitamix. Amazingly smooth smoothies. 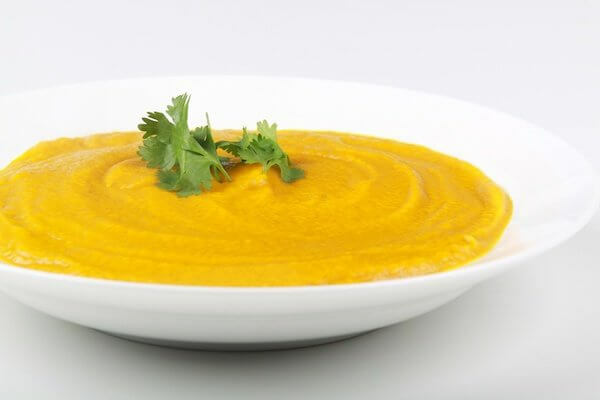 Smooth soups without straining. And then things you can’t make in a blender. Frozen desserts. Hot soups. Yes, the machine is so powerful that it can actually heat a soup to steaming, tongue-burning temperatures by just the friction of the blades. In 5 minutes. For our first soup, we made this simple pumpkin soup recipe since we had all the ingredients on-hand. The only prep work was sautéing an onion and 2 whole garlic cloves. After that, all the ingredients are placed in the Vitamix. (The pumpkin is canned purée.) My model has pre-programmed settings, so I set it to “soup”, and start it up. Five minutes later, I’m pouring piping hot soup into bowls. The soup was delicious and nobody would ever guess it was that easy. Make it vegan. This recipe can be easily made vegan by substituting the chicken stock with vegetable stock.